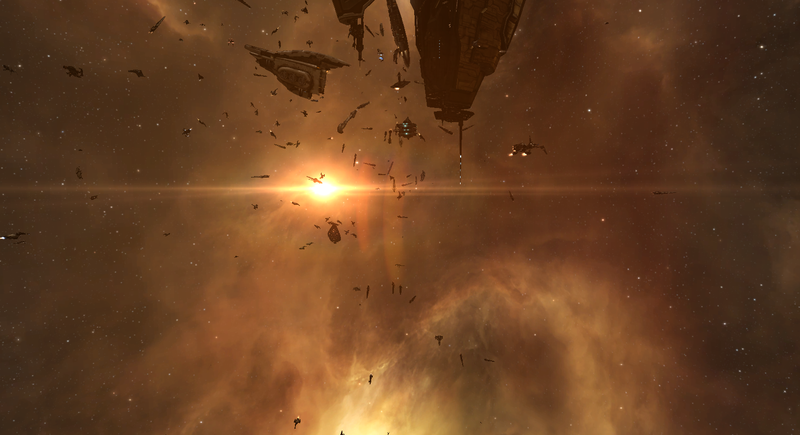 Aurora News: Revenant Carrier destroyed as promotional stunt by Eve-Bet! Revenant Carrier destroyed as promotional stunt by Eve-Bet! Ever since the shutdown of the Blink gambling site since Concord Command Personnel (CCP) arrested its owner Somer, many gambling sites attempted to claim this marketshare for themselves. From launching promotional campaigns to high chance rounds, they attempt to attract the former Blink customers to their venues. In light of this, Eve-Bet decided on organizing a large scale & expensive stunt to grab the attention of capsuleers across the cluster! They would deploy a Revenant Carrier to be shot at by capsuleers in a lowsec system. 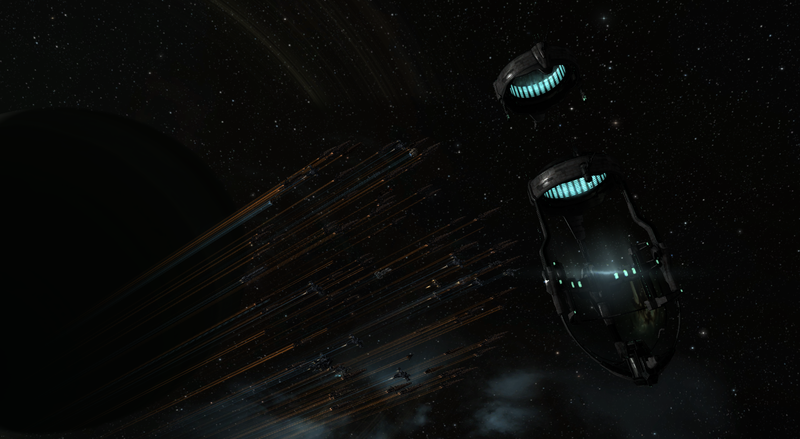 These Revenant Carriers are extremely rare & expensive and are of Sansha design, sporting advanced technologies. To deploy such ship to be destroyed would surely attract massive attention, and it did! Hi ho! Hi ho! Its off to battle we go! As the hour of the event came closer, corporations, alliances & mixed fleets all across the cluster geared up for battle. Downing a capsuleer Revenant is a rare thing, as there has only been one destroyed prior, namely a Pandemic Legion Revenant, destroyed in Placid last year. Now capsuleers had a unique opportunity to destroy another of these rare super carriers! When Nisuwa was announced on 21H as the target system, thousands of ships undocked across the Eden cluster, throwing Traffic Control off guard. This caused delays all across the cluster as capsuleers made their way to the Nisuwa system. As reports began flooding in of traps & massacres, it became apparent that many capsuleers relied on their auto-plotter to set out a route, sending them through Tama. Under normal circumstances, Tama is already a dangerous system, being a gateway into low. But that day, it was an outright death-trap! Many capsuleers got caught in the massive gatecamp, but many more survived as there were more targets present then the gatecampers could shoot, allowing them to continue their way to Nisuwa! Once arriving in Nisuwa, things heated up. While many of the more organized fleets sought out a secure location to await the arrival of the Revenant, several fleets acted on the rumour that it would arrive at the Nisuwa station. As more & more folks jumped to the station, the fighting grew along with it, albeit the station guns did keep the aggression down as they fired at any aggressors. However, once the Russian combined fleet jumped in, they cleared the area of all aggressors with their Tornado's & Talwars and claimed dominance on the grid. The station fight was not an isolated incident, as fights broke out all across the system. Many of the gates saw combat, as people warped in & got greeted by those already present. The chaos did add fuel to the fire, as the gatefights often ended up in multi-way fights. Also various 'easy' safespots saw hostile action as well, as roaming fleets searched out the weaker fleets to engage in combat. As the hour of the Revenant's arrival came closer, people got all hyped up in local, all spamming Dscan but also spreading disinformation. Among one of these was the appearance of a cyno, causing alot of people to flock to this beacon! But then word got out! The Revenant was sighted in the system! It actually arrived a mere 100 km from my cloaked reporter ship... giving me a front seat view of the unfolding glorious chaos that this battle would bring! In only a matter of minutes, massive fleets from various alliances, corps & mixed organisations warped in! The site just exploded in activity! One moment there was only a handful of ships, the next, thousands! And still, more and more capsuleers flocked to the system, putting Concord's traffic control to the limits & beyond! As the Concord capsuleer monitoring network was pushed beyond its limits, capsuleers kept jumping in, all wanting to claim a piece of the Revenant! Determined to eliminate competitors, they all engaged each other. The ensuing chaos was colossal, leading to fights that sometimes spanned over a dozen fronts for certain fleets!The less organized fleets were the first to go down. However, many of the more established uniform alliance & corp fleets also received their share of attention! Many of the 'big boys' were present: Goonswarm, Test, Pandemic Legion, Brave Newbies, Black legion, Waffles, RAZOR, RvB, Eve-Uni and many more! Among all this fighting & chaos, one form of organized fleets escaped alot of aggressive attention from others while they continued their attacks. These are the NPSI fleets, organized fleets that are composed by a large variety of corporations & alliances. These organized fleets were Spectre, Redemption Road & the Russian Fleet chief among them. All these fleets attacking each other & the Revenant provided for a colossal chaotic firefight... Not all fighting centered on the Carrier however, as the Cyno beacon proved to be an excellent second hotspot for combat, where Spectre took control over the battlefield. And so it begins... hours upon hours of fleet combat, between thousands of capsuleers and their ships, from frigates to capital ships! No detailed combat reports exist from this stage of the fight, as it was just one ball of chaos & firepower. Fleets warping in, fleets warping out, guns cycling, drones flying, missiles striking. Some fleets couldn't handle the chaos, withdrawing as they couldn't get a good look at the situation, but frankly, no-one could due to the massive number of capsuleers present and the large variety of fleets. The fight at the Cyno beacon would be concluded first, as Spectre had estabilished dominance there, allowing them to take out anyone who attempted to challenge them. They even managed to take out a Thanatos that had arrived on the field without a support fleet for reasons unknown : Thanatos Down! This would turn out to the top killmail for this event, outside the Revenant supercarrier! Meanwhile, the combat around the Revenant was still in full swing, no fleet managed to establish permanent supremacy. To complicate issues further, additional fleets jumped, in, like Elite Mining Services, Ev0ke, Synergy of Steel and more. As the slaughter continued, hundreds of ships were destroyed every passing hour! As the death toll rapidly rose up, the Revenant supercarrier suddenly started taking alot more damage! It seemed that its defensive systems had failed or just stopped working! Acting on this, many capsuleers changed targets to the revenant, all hungry to get a chance on the prizes handed out by Eve-Bet! And so, the supercarrier finally went down in a great blinding explosion, targeted by hundreds, maybe even a thousand capsuleers! An official Killmail cannot be provided as Concord suffered a massive data overload that crushed their kill registry servers in an attempt to create this datafile. However, an unofficial killmail datafile has been generated: Revenant kill list: Over 3700 capsuleer attackers listed, file provided by NullSecHobo. And so the fight endured, Goons fighting Test, Test fighting Pandemic Legion, PL fighting Eve-Uni, Eve-Uni fighting Brave and so on. Many also attempted to withdraw from combat, only to get caught by chasing fleets or gatecamps on the other side. Then a new contender showed up, all ready for combat & kills! The Quantum Cats Syndicate joined into the fray, their goal: eliminate the stragglers & severely weakened fleets. The arrival of this fresh & strong fleet was too much for the battered combatants who could barely resist against their vulture tactics. For hours on end, QCATS would hunt down & kill hundreds of ships & their capsuleer pilots with little resistance. The weakened fleets had no response to this new threat, but to flee from them. QCATS successfully chased out or hunted down many ships from the larger alliances that are feared by others. The only group that managed to stand their ground was Eve-Uni, who had regrouped after suffering a series of losses earlier. Once they were ready, they adapted the Quantum Cats Syndicate tactic of vulture combat, chasing after weakened targets and taking them down! And so the combat finally died down, hours after the Revenant was destroyed. Quantum Cats Syndicate would still chase stragglers all day long however, teaching them what happens when you trespass one of their staging system without their permission. All in all, the Revenant Destruction promo campaign by Eve-Bet turned out to be a massive success, seeing close to 5000 capsuleers present in the system, all ready to pounce on this unique opportunity to take out one of the rarest capsuleer-flown ships, the Revenant Supercarrier. Other gambling sites will have a hard time to beat this promotional campaign for attention! As noted, no fleet managed to obtain dominance on the Revenant combat grid due to the heavy fighting that went on. There were just too many fleets present, anyone who would claim dominance would attract the attention of others, nullifying their supremacy. While alot of the large uniform alliance & corp fleets have suffered quite some losses, the NPSI fleets reported a surprising lack of losses. While they did lose ships, it was far below their expectations. This might be due to their fleet members being a mix of various capsuleer organisations, causing them not to appear as a coherent bloc on scanners and such and thereby attract less attention than a uniform alliance or corp fleet. The battle itself is among one of the largest battles fought in a single system. The variety of fleets attacking each other did create an untangleable mess of a fight however, where it's hard to discern any details from. Add to this that initially Eve-Bet faced a few communication issues at start, allowing hostile elements to spread disinformation and the chaos was complete. The high load on the Capsuleer monitoring servers did create alot of issues, causing capsuleers to go in lockdown mode and their ships travelling automatically to a safe location to systems receiving conflicting commands, resulting in unresponsive weapons, engines & defenses. The combat at end was interesting as well, as QCATS arrived fresh on the field, clearing up anyone who was still present. They didn't go head on with fleet fights, but rather picked apart anyone who got separated from their main fleets, an occurrence that was all too common after hours of combat. Only Eve-Uni managed to avoid being picked apart by QCATS as they successfully reorganized themselves & even went to hunt down stragglers themselves in a cohesive fleet. Big thanks to this capsuleer for organizing vital & detailed info in this file. Will be very helpful in cross-referencing & verifying the damage done by each capsuleer in order to be eligible for the Eve-Bet awards. Eve-Bet Latest News Shows the prize distribution handout & what community generated Revenant Killmail they used. Nisuwa system combat report Warning! Huge! Over 33 pages of combat related to the Revenant combat! See from 5 september to 6 september for all the kills. EVEOGANDA: Live Paint Drying Battle, a news article from capsuleer Rixx Javix, focusing on the extreme Time Dilation that happens when too many capsuleers are present in a system, overloading the capsuleer monitoring servers. More links will arrive as I attempt to gather additional info. Do expect an update when the Revenant Killmail becomes available. People providing image & video feeds are also welcome! You will be credited for these!